Simnel Cake is an Easter classic that comes at just the right time after Christmas to fill the need for a good fruit cake with a generous covering of marzipan on top. 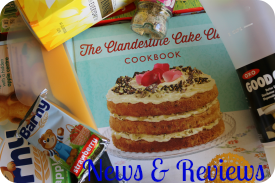 If you like marzipan and I fall into the 'love marzipan camp' then this cake is an extra special treat for you. The traditional topping is of 11 round marzipan balls to represent the 11 faithful apostles with Judas Iscariot excluded. Years ago it was baked by girls in service in large houses to take to their mothers on Mothering Sunday, which falls in the middle of lent. As we no longer live in Downton Abbey times it has become a cake to serve a couple of weeks later on Easter Sunday. 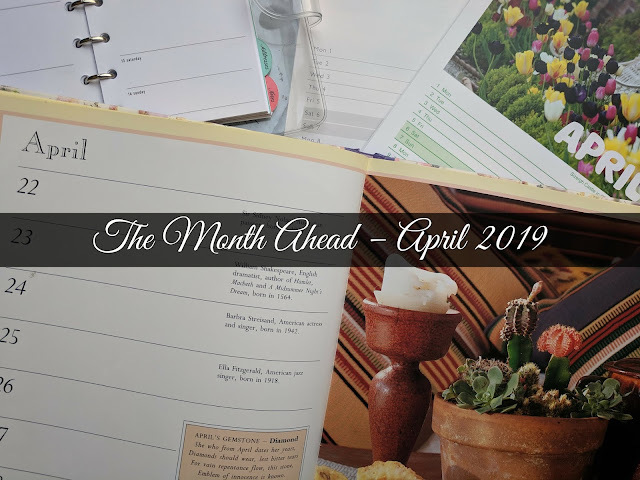 As ever I have a few tricks and twists to save save pennies and a little bit of time. 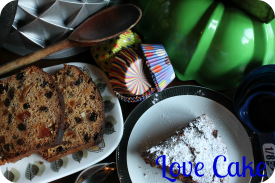 Forget about buying separate quantities of currants, raisins, sultanas and mixed peel – the leftovers will end up lingering in our kitchen cupboards and by Christmas will have become a dry sugary mess. Simply buy a packet of mixed dried fruit and have done with it. The cheapest supermarket ranges – value/basics/savers/essentials or whatever else they want to call them – are absolutely fine. Once baked in a cake you will never know the difference. If you don't use a lot of marzipan then don't bother with buying a whole jar of apricot jam for the glaze unless you really like it and think you are going to use it. Any preserves will work as what you are looking for this something sticky to glue the marzipan. If you have none at all some supermarkets sell the small jars of jams that you find in hotel breakfast rooms and cafés serving afternoon tea. Equipment: 7in (18cm) loose-bottomed, deep cake tin. Line it with reuseable non-stick liner, paper liner, parchment paper or grease well. Rolling pin for the marzipan. 1. Pre heat the oven to 150°C/Gas Mark 2. 2. In a large bowl put all the cake ingredients in and mix well until all the ingredients are combined. If you find it hard to stir the mixture use an electric whisk on the slowest setting. 3. Cut the marzipan block into three equal blocks. 4. Dust a flat surface with the icing sugar and roll out one of the marzipan blocks so it is the size of the cake tin bottom. 5. Put half of the cake mixture into the tin. 6. Carefully lay the marzipan round on top of the cake mixture. Gently push the sides down so you can't see any more of the cake. 7. The remaining cake mixture should be put on top of the marzipan. 8. 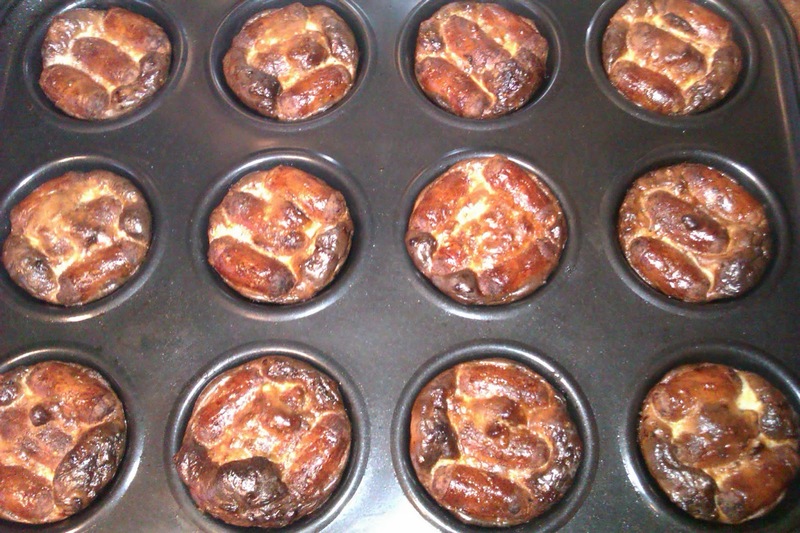 Bake for around 1½ hours and then check that the top isn't burning or cooking too quickly. If it is then cover with some greaseproof paper. 9. Bake for another 45 minutes. Check it is cooked through by inserting a skewer and seeing if it comes out clean. 10. 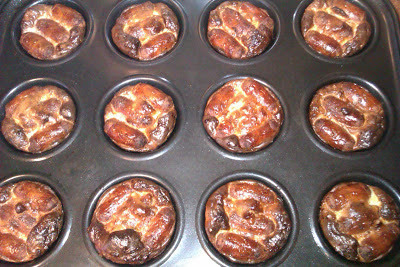 Leave the cake to cool in the tin for a bit before turning out and leaving to cool completely on a wire rack. 11. Once cooled roll out another block of the marzipan like before as this is going to cover the top. 12. Heat the jam in a small saucepan so it is just warm and starts to get a bit runny. 13. Brush the top of the cake and then place the marzipan on top. 14. With the last block of marzipan roll it out to a long sausage shape and cut into 11 equal pieces. Roll each of these into a ball. 15. Brush the bottom of each of the marzipan balls and place around the edge of the cake. 16. Decorate the marzipan as you wish – you can press the edges down to form a frill or score the top lightly with a knife in a diamond pattern. 17. Beat the egg white lightly to loosen it and then brush the marzipan topping with it. 18. Heat the grill and place the cake under it. 19. Keep an eye on the grill as it burns very quickly! 20. Remove when the marzipan is just coloured. I think I saw the yellow reduced label before I had a chance to work out what herb plant was inside the plastic wrapper. It turned out to be mint. 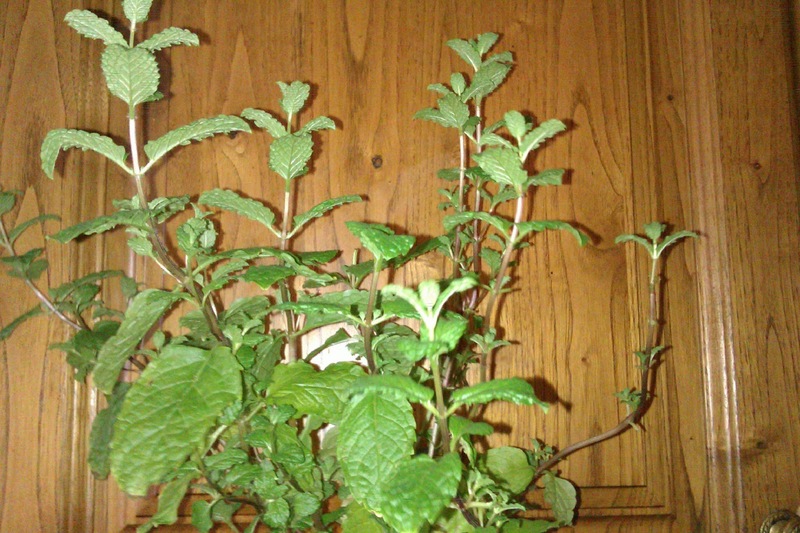 I can't say I've ever used much mint in my cooking but I thought something alive and green would cheer up my kitchen window sill in these days of everlasting gloom and darkness. So it sat in its pot having regular waterings until Jen at Blue Kitchen Bakes announced that as this month's host of Pasta Please! she had decided the theme to be pesto. Pasta Please! 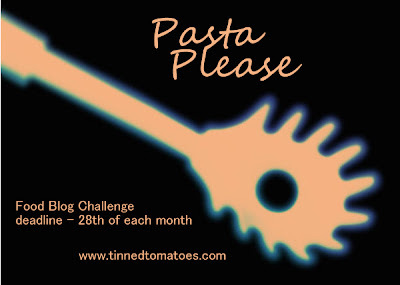 is a monthly challenge organized by Jac at Tinned Tomates with guest hosts deciding on a different theme. Now I love pesto but making it at home can be a costly affair, especially when you can often find jars of it on offer in supermarkets for about a £1. Thankfully I had just enough pine nuts left from a previous recipe to make some pesto. I resisted the temptation to scoff the pine nuts because they really are a luxury and deserve something special to be made with them. The other main ingredient I would need for my pesto would be Parmesan or some other Italian hard cheese. 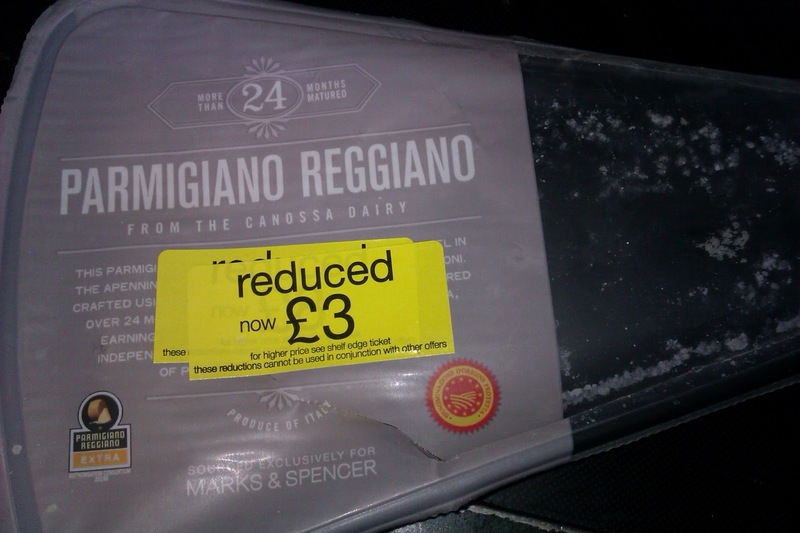 I've been steadily working my way through a sizeable chunk of Parmesan since I found a piece of it reduced from £10.19 to £3. While I could have easily eaten a trough of pesto on its own I felt it needed to be paired with something. I served the pesto with some casereccie pasta simply because I was swayed by the packaging saying it was perfect with pesto (and the fact it was on offer at 50p for 500g). 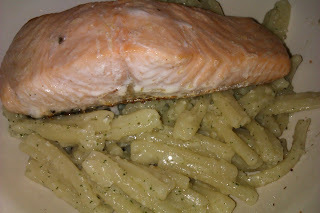 Routing through my freezer I came across some salmon fillets; thus completing my search for a perfect Saturday night meal. 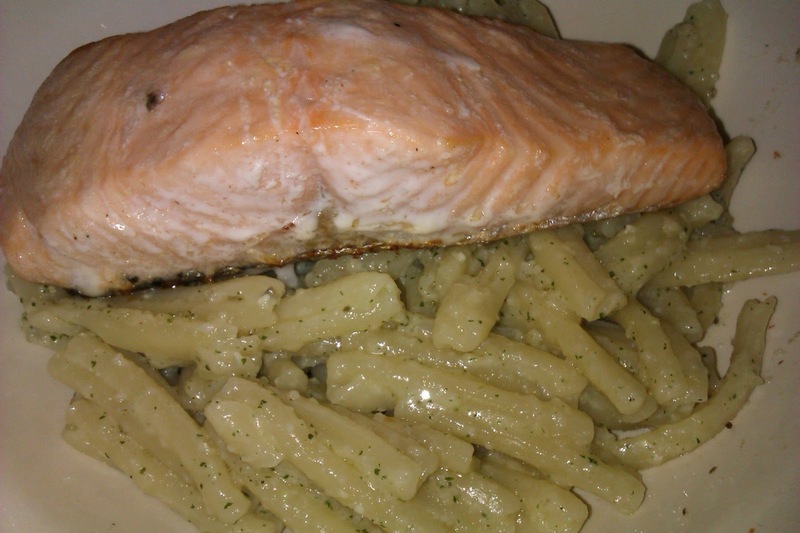 The salmon fillets were simply pan fried until cooked through. The pasta was cooked as per the instructions and I allowed 300g for 4 servings. When mixing the pesto with the pasta I used a little bit of the cooking water from the pasta to thin out the pesto. Remember you can always add extra liquid but you don't want a watery mess! 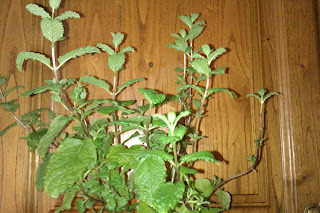 The proportions I have given for the pesto ingredients give quite a strong Parmesan taste with the mint flavour coming through afterwards. If you want a less cheesy hit then obviously reduce the amount of Parmesan you put in. As the pesto is heated through rather than cooked I use extra virgin olive oil as I think it gives a better taste when used in a more raw state. If you don't have any just use ordinary olive oil. 1. Put the Parmesan, pine nuts, mint and garlic into the bowl of the food processor or blender. Blitz until the pine nuts have been crushed. 2. Add the olive oil gradually, giving a quick blitz with each addition until it has all been added. 3. 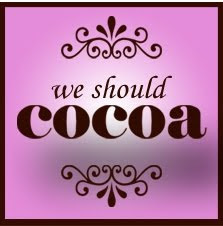 With a spoon stir the mixture to ensure all the ingredients are blended together. 4. Use as required as a pasta sauce, on bruschetta or as an additional flavouring on pizzas or in salads. Pesto keeps well for a couple of days in the fridge if stored in a jar with a tight lid. Just give it a stir before using as often the oil will separate. Alternatively it can be frozen in ice cube trays. If there is one drink that is associated with Ireland it's got be Guinness. There are other Irish stouts, the cream liqueurs made famous by Baileys plus a variety of whiskeys but Guinness would top the Family Fortunes' poll. If you're not a fan of the black stuff then the best way to celebrate St. Patrick's Day is to stick in some cooking. This is all the more appropriate if once the middle of March comes and the sky seems constantly full of snow; a hearty and warming casserole will do the trick. 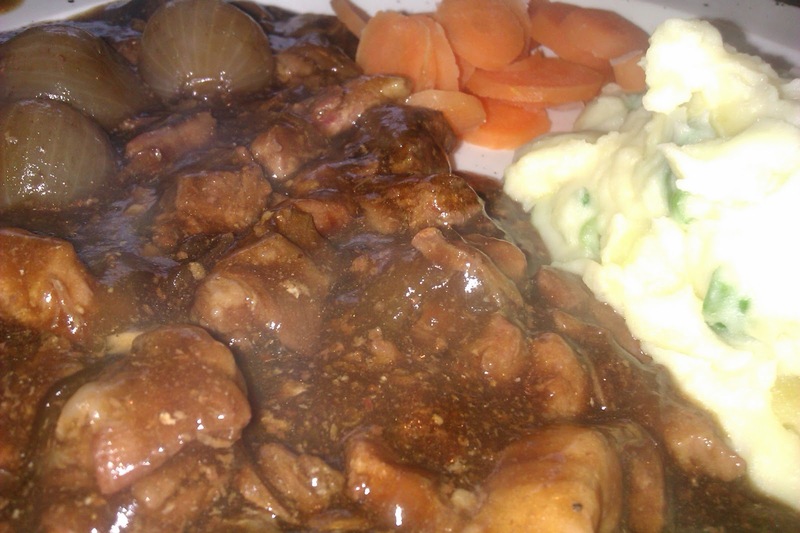 I cook this meal in my slow cooker but if you don't have a slow cooker fear not as it is really a very easy recipe as it all goes in the dish and then cooked; so I have included the timings if you wish to cook it in the oven. One of my slow cooker tips is if you think you will be out too long even if you set it on 'low' then use a timer switch. Since beef isn't the cheapest food item I used half beef and half cooking bacon (usually has some smoked bacon in for flavour). You can vary the quantities but don't put more than 50% bacon in as this will overpower the taste of the beef. As there is quite a bit of bacon in the recipe I don't put any extra salt in but if you think it needs more then add according to personal taste. The addition of caster sugar is to counter the bitterness of the Guinness so if you use a sweeter stout or beer you may want to leave the sugar out. This recipes uses half a bottle of Guinness so the question is what do you do with the rest of it? You could raise a glass to St. Patrick and drink it with the meal. Alternatively if you have a number of guests make double or just make double anyway and freeze the second portion. A nice way to round off the meal would be to finish off with a slice of Chocolate Guinness Cake, which rather conveniently uses half a bottle of Guinness. If required to thicken use either 1tbsp (15ml) cornflour mixed with 1tbsp (15ml) water or add some instant gravy granules. 2. Put all the casserole ingredients except the cornflour/gravy granules in the slow cooker or casserole dish. 3. Leave to cook on low for 7-9 hours, on high for 4-6 hours or in the oven for 1¼ hours. That is it – really! 4. Turn off the slow cooker or oven while you prepare the Champ. If you think the casserole needs thickening do so now. Keep the slow cooker dish covered and on the stand or the dish in the oven. 5. Place the potatoes in a large saucepan with just enough water to cover. Bring to the boil and then cook until the potatoes are tender – around 20 minutes. 6. Drain the potatoes and return to the pan. 7. Over a low heat mash the potatoes and then mix in the spring onions and the cream or milk. Add any seasonings required. Heat through gently but do not boil. 8. Serve with the casserole and vegetables. 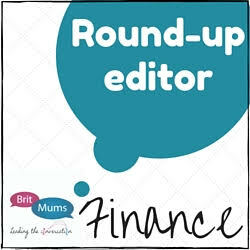 Anybody reading a few entries on this blog will have probably realised by now that not much enters into Jibber Jabber Towers if it isn't free, reduced or on offer. I believe though that a food bargain isn't really a bargain if it is something you wouldn't usually buy and you just scoff it as an extra. 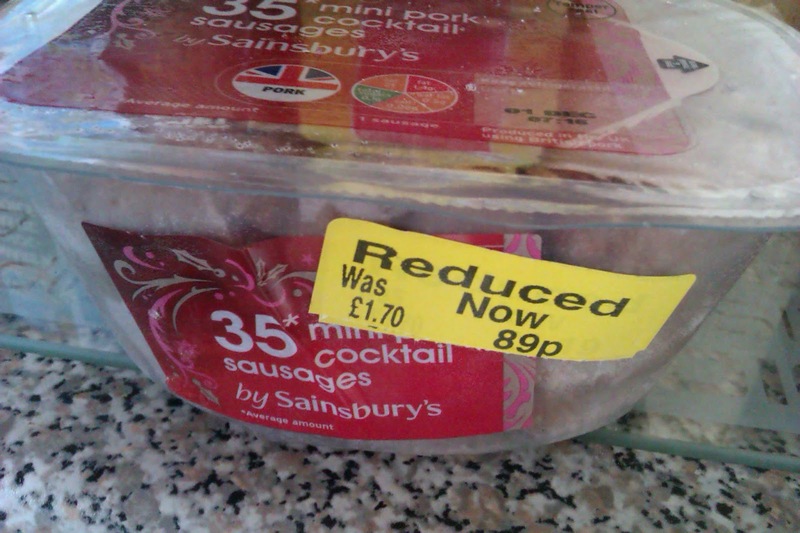 So when I spotted a packet of cocktail sausages with nearly 50% off I knew they shouldn't just be left open on the table so anyone could come and pinch one. The only thing that should be done with these is make them in easy and tasty dinner for all. 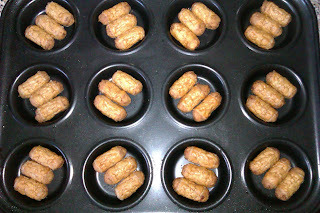 Alternatively, you you serve these as originally intended at a party or buffet but show your guests that you have made more of an effort than simply chucking some sausages in a bowl. Toad in the hole may not seem like the height of gastronomy or indeed a dish that many people need to be told how to make. However, the idea of giving you this recipe is a little inspiration as something different to do with a pack of cooked cocktail sausages and also the right amount of ingredients needed, plus the cooking times. 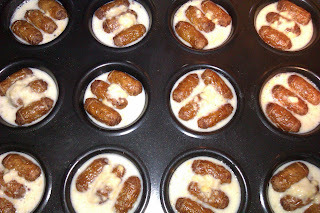 As the sausages take up most of the space in the hole you really don't need much batter mixture. I've proportioned the cost of the ingredients: Sausages – 89p, Flour - 2p (£1 for 1.5kg), Egg – 17p (£1 for 6 free-range large eggs), Milk – 3p (£1 for 2.27 litres). Total cost therefore is £1.11 with each portion coming in at under 28p each or just over 9p per 'Toad'. As this has turned out to be such a cheap meal I will be putting it forward to March 2013's Credit Crunch Munch which is hosted jointed by Camilla at Fab Food 4 All and this month's host Helen at Fuss Free Flavours. Serves 4 as a main meal or 12 party/buffet portions. You will need a non-stick 12-cup bun tin. 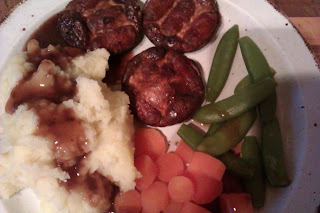 To serve: Potatoes of your choice (we had mashed), vegetables (we had carrots and sugarsnap peas in the fridge) plus gravy. 2. 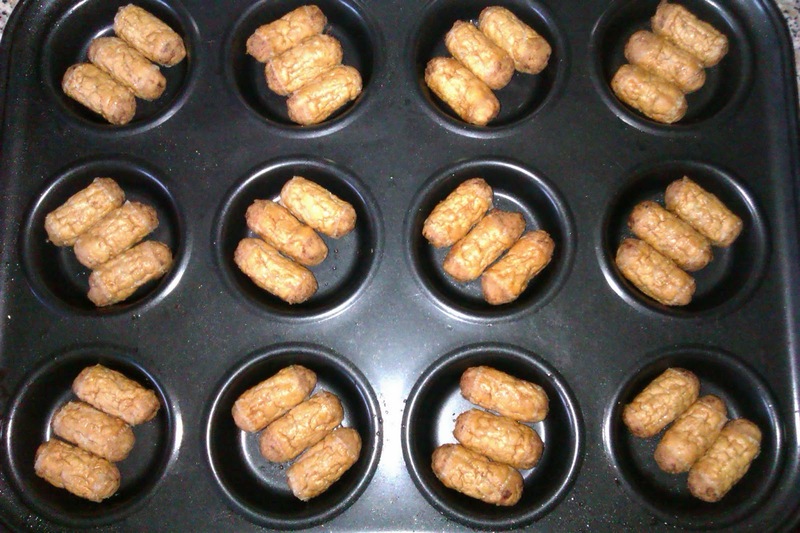 Arrange the sausages in the bun tin. You should be able to get 3 in each hole. 3. Cook the sausages for 10 minutes. While they are cooking prepare your batter mixture. 4. In a bowl the egg to the flour and beat together. Add the milk and beat again until all the ingredients are combined. You don't need to worry about lumps. 5. When the sausages have cooked for 10 minutes pour the batter mixture into each hole. 6. Cook for a further 15 minutes. 7. Serve with the potatoes and vegetables of your choice.